The main approach of the Onanya to remove negative energies is energy medicine that comes in the form of song – ikaros. Sound is a form of energy frequency (vibration) through which communication and healing can take place. Traditionally, sound has been used for healing in many cultures. Throughout the indigenous tribes of South America, plant songs are an integral part of the healing process. The Onanya explain that all plants have their own songs and these songs, the ikaros, are taught to the healer during dietas – extended periods of time in isolation adhering to strict dietary conditions designed to receive the healing energy and teachings of the plants. Each different master/teacher plant possesses songs that are given to the apprentice. The apprentice carries out numerous dietas while in training, typically for a minimum of four years and then continuing to diet plants throughout their life as an Onanya. These healing ikaros – puro sonido (pure sound) from the plants – form the backbone of the energy work during ceremonies. The ikaros work in combination and cooperation with ayahausca to purge negative energies as well as fill the body with plant medicine. The ikaros given over the duration of a workshop become like allies, working closely with each participant for a much longer period of time in order to bring about gradual transformation. They can be considered the “seeds of change” that are sown into the system of each participant at the Temple, which then grow into trees over time. They support us, lay down roots, and branch our lives outward to unify and connect us to the sacredness of all life. The Temple of the Way of Light is proud to present a new recording containing a selection of ikaros and arkanas sung by male and female shamanic healers from the Shipibo tribe who live along the river Ucayali and its tributaries in the Peruvian Amazon. 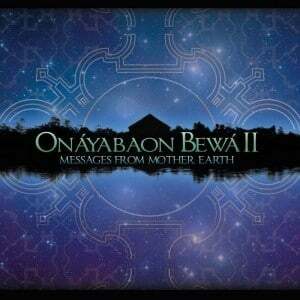 Onányabaon Bewá means the “songs of the shaman” and this disc carries messages from Mother Earth through the songs of Amazonian plant spirits transmitted to the shaman. All the songs have been professionally recorded live in healing ceremonies at the Temple of the Way of Light in the rainforest outside of Iquitos, Peru. All profits from album sales are split between the featured indigenous healers and the Temple’s sister organization, the Chaikuni Institute – a Peruvian non-profit organization set up to help protect the Peruvian Amazon and preserve the culture and cosmo-vision of its indigenous people, particularly the Shipibo.